MOSCOW, December 6. /TASS/. The finances invested in the organization of the 2018 FIFA World Cup in Russia boosted infrastructure development in the cities, which hosted matches of the championship, Russian Prime Minister Dmitry Medvedev said on Thursday. "We have spent approximately 650 billion rubles [$9.7 billion at the current exchange rate] on the organization of the World Cup," Medvedev said. "It equals the sum spent monthly on the operation of the pension system." "This is a big sum, but it does not look as such compared to current budget expenditures," the premier said. Medvedev added that that the world championship helped to earn 200 billion rubles on top of the spent sum "therefore the balance is in favor of what had been done." 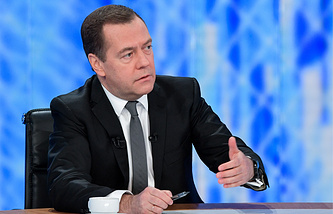 Results of the world championship must not be evaluated only arithmetically, Medvedev continued. "Some of the cities, which hosted the matches, had no normal airports and hotels, but they have everything now," he said. "It boosted the infrastructure development as well as well as the development of medical and social services." Medvedev said in conclusion that Russia managed to organize "the best World Cup in history," and "it seems that everyone agrees with this fact, even those, who are not in sympathy with us." This summer, Russia hosted its first-ever FIFA World Cup, which kicked off in Moscow with a remarkable opening show at the Luzhniki Stadium on the evening of June 14 and ended with a spectacular final match, played also at the Luzhniki Stadium, where France confidently defeated Croatia 4-2 to win the much-coveted World Cup Trophy. The country selected 11 host cities as the venues for the matches of the 2018 World Cup and they were in Moscow, St. Petersburg, Sochi, Kazan, Saransk, Kaliningrad, Volgograd, Rostov-on-Don, Nizhny Novgorod, Yekaterinburg and Samara. Two of the hosting stadiums were located in the Russian capital. The national football team of hosts Russia managed to make it to the quarterfinals stage of this world championship, where Croatia edged them out on a 4-3 penalty shootout win on July 7 at the Fisht Arena in Sochi.